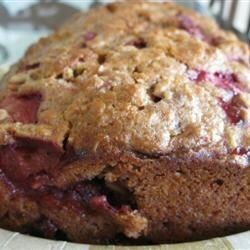 "Fresh strawberries make this delicious bread so flavorful. I tried to make this bread as healthy as possible... (I'm on a health kick right now) and I think it came out great!" Preheat the oven to 350 degrees F (175 degrees C). Grease 2 loaf pans with some oil. Stir all-purpose flour, whole wheat flour, oats, white sugar, brown sugar, flax seeds, cinnamon, baking powder, and salt together in a large bowl. Whisk oil, eggs, and yogurt in a smaller bowl. Stir into the flour mixture just until combined, using hands if batter is very thick. Fold in strawberries. Pour into the prepared loaf pans. Bake in the preheated oven until a toothpick inserted into the center comes out clean, 50 to 60 minutes. Cool on a wire rack. A delicious bread made with fresh strawberries.